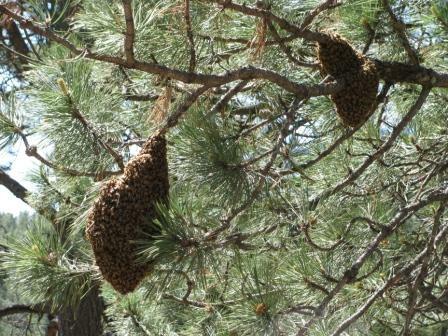 Every Spring, our club officers and members capture numerous swarms in the Black Hills and surrounding area. If you encounter a swarm, contact the following people. Tom Allen (605-721-8859) — West Rapid but will go just about anywhere in Rapid City. If you encounter a honey bee swarm, DON’T KILL THE BEES !! Here are a couple of examples of swarms — on swarm on a log and another forming in a pine tree. Honey bees are valuable and provide tremendous benefits, specifically pollination, honey and wax and their population is rapidly declining around the world. Honey bees are quite gentle but there are times when honey bees can be an annoyance or nuisance and for sting-sensitive people, a health threat. Swarming is one of these times although swarms are not dangerous under most circumstances. 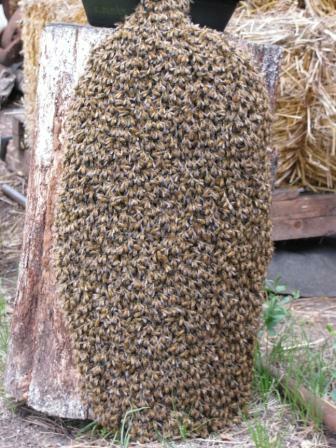 Swarms occur for a variety of reasons including congestion in the hive and overheating; but it is also a natural part of reproduction of the colony. A colony divides and part of it leaves for a new home site, usually with the old queen, while the remaining members continue at the original site with a newly emerged – and later mated – queen. In this manner, a single unit becomes two. A honey bee swarm may contain hundreds or thousands of worker bees, a few dozen drones and a single queen. Swarming honey bees fly temporarily, and then cluster on shrubs and tree branches. The clusters rest there for several hours to a few days, depending on weather conditions and the amount of time needed to search for a new nesting site. A swarm typically occurs in late spring and early summer and begins in the warmer hours of the day. A swarm of thousands of bees congregated in one area can be intimidating, even frightening, to people but in general, honey bee swarms do not harm anyone. Bees that swarm typically engorge themselves with honey before leaving the hive and they are usually quite gentle. Or — In many cases, you may not want to do anything but admire the swarm from a safe distance. Swarms are temporary and the bees will move on if you patiently ignore them.